I know that Boden can be pricey when it's at full price but I probably buy about 70% of my Boden stuff in Clearance as their sale is really good with decent reductions. I thought it would be interesting to see if I could make a complete outfit for less than £100. Now it would have been easy to just pick the items most reduced with limited sizes but I did my best to select items that have at least 3 or 4 sizes left in stock. 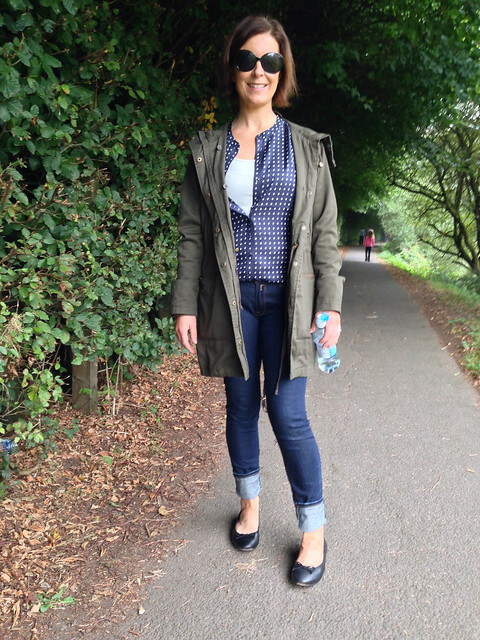 I also focussed on items that are suitable for autumn dressing and that are classic enough to stand the test of time. OK, OK..so the scarf is new season....but it's gorgeous! 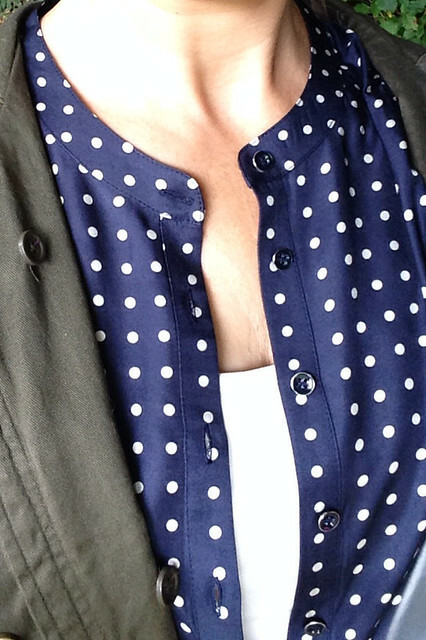 Finishing with a quick outfit from yesterday - wearing a the Soho spotty blouse from Boden clearance that I only ordered last week (thankfully not further reduced this weekend!). A total bargain also and a brilliant neutral alternative to a breton. It's a silk/viscose mix too so is lovely and soft to the touch. Sunglasses - Moschino from TK Maxx Clearance! Blog reading is bad for the wallet. I am trying not to spend any more money.!!! I buy quite a lot from Boden (children's too) and always at least 20% off and sometimes a lot more when it's clearance like this. It lasts too, I've been pulling some of my older boy's clothes out of storage for my youngest and it's been well loved but still all looks great. Definitely ordered 6 Mini items for Elodie as we drove up the M40 on Friday. It arrived Saturday morning even though I didn't pay postage. It's all gorgeous. Most of her clothes are sale Mini items, I just can't resist. Didn't bother looking for me but I'd have had the beige chinos in a heartbeat at 80% off! Thanks so much for this. Am a big fan of Boden sales and never buy their full price items. These shoes are exactly what I want and they have them in my size. I am having a Boden party in October and looking forward to it. Love your outfit and your £100 outfit too. Boden are still one of those retailers I'm yet to try though I have seen a few bits I like, I could only shop there when they are having a clearance event, usually when I'm broke. It will happen though! Can't wait to see what they bring out around Christmas!